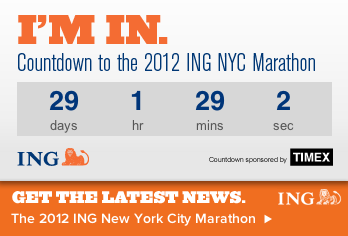 Officially under a month until the marathon. Not freaking out at all. Next week is my 20 mile long run and then I begin my taper. It seems like last week I just started training for this thing. Wait, no it doesn’t. It really does feel like I have been doing this for months. But I am starting to get anxious about this day — in a good way. It is at that point where I start planning out things I do in the weeks leading up to the marathon. It started last week with my annual viewing of The Spirit of the Marathon. I always watch that a week before the Chicago Marathon. When it gets to the point when all of the runners are getting ready for the 20 mile long run, I always getting giddy. That 20 mile long run is a big deal, especially if you only do one during your training. I’m running the Staten Island Half Marathon tomorrow morning so I won’t be able to watch Chicago on the Internet like I have in the past but I will be thinking about all my fiends running it as slog my way through Staten Island. It will be nice to see the island on something other than marathon Sunday. In three days I’ll start re-reading Liz Robbins’, A Race Like No Other, one of the best books written about the New York City Marathon. The 26.2 chapters is perfect for a chapter a day leading up to the race. I already know what I’ll be wearing so that is easy to get together. But I will be heading to Modell’s to pick up my throw away sweats so I get the best selection. Although it is fun to see all the marathoners there the week of marathon looking through all the sweats. I’ve got my Gu and other race day items so I’m all set and trust it is nice to have that peace of mind. If there is one thing I can recommend to a new marathoner, start getting all of this stuff a few weeks before your marathon. This will save you from running around the week of your marathon and you can think of others things like what if I have to pee during the race. My one new addition will be adding my name to my shirt. For the past two years I have been a purist by not doing that. But, every year I run in a couple of races that personalize the bibs and it is always a nice boost when a total stranger yells out your name in support. So, for my biggest event I will be doing that. I have hunted down the perfect orange duct tape that matches what I’m wearing and will stand out beautifully. Again, I got it early enough so there will be no worries race week. My countdown continues with a little 5k in my village today, one block from house. It is such a nice feeling knowing that I can just stroll on over to a race. Then tomorrow is the half. I plan on easing into this marathon with as little stress as possible. This entry was posted in Half Marathons, NYC Marathon, Races, running and tagged A Race Like No Other, Duct Tape, gu, marathon training, Modell's, NYC Marathon, NYRR, racing, Running, Spirit of the Marathon, Staten Island Half Marathon. Bookmark the permalink. Sounds like you’re nearly ready!!! !